We recommend booking ahead of time. Class space is limited. Class may be canceled in the event of low sign up. Workshop Description: The Haystack Rock Awareness Program and the Cannon Beach Arts Association invite you to join Susan Spence, local artist, graphic designer, and instructor for this very special opportunity to make your own beach basket sculpture from “foraged flotsom”- found and recycled local crab fishing rope. Susan will walk students through an introductory class where students will pracicde hand weaving techniques using recycled ropes collected near and around the Columbia River. Not only will you get to take your special creation home with you as a special reminder of your time creating, you will also have contributed as a change maker for ocean stewardship! Student Notes: Crochet or knitting experience is helpful but not required. Left handers must be able to reverse instructions. Check out YouTube for a “basic single stitch crochet tutorial” for a head start to class. Susan Spence is a graphic designer and artist living on the Long Beach Peninsula in WA. Susan teaches adult classes locally for both beginner and intermeddiate weavers wanting to learn the craft and has also taught 5th grade art. On her daily walks along the ocean’s edge Susan envisioned a new life for the cast-off cordage that drifts in. Each piece of foraged rope is carefully cleaned then hand-stitched and finished into a one-of-a-kind piece by Susan, who possesses a keen eye for quality, artistry and color. 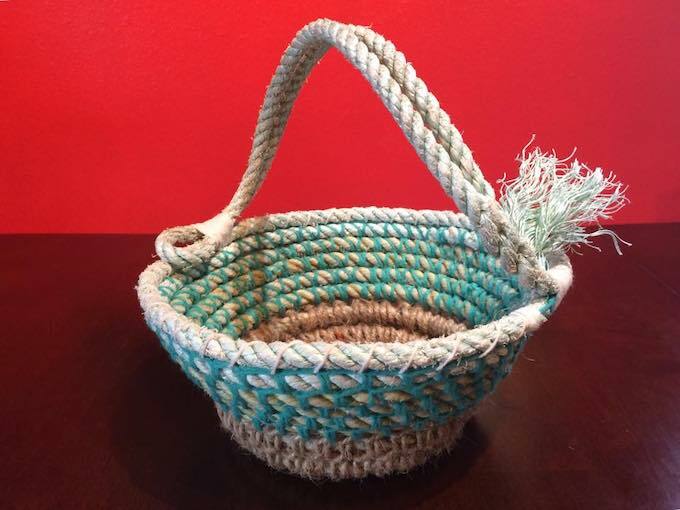 Susan creates peices made from recycled and foraged fishing rope, acrylic yarn, cotton twine, jute accents of found dried kelp, driftwood, lead fishing weights and more creating gorgeous peices that can be found in Astoria and Cannon Beach galleries. Susan is passionate about recycling rope into sustainable baskets that help keep it off the beaches and out of the oceans and landfills.